California law SB 420 mandates every county to establish a Medical Marijuana ID Program to issue optional ID cards to people with serious medical conditions and their caregivers. With or without the optional ID card, people with documented serious medical conditions and their caregivers are protected from arrest for possession, transportation, deliver or cultivation of marijuana. The law requires that a physician certify that the person has a serious medical condition and that medical marijuana is appropriate for their use. The physician certification can be used in lieu of the optional ID card. Patients meeting the above conditions may call Contra Costa Health Services Public Health at 925-313-1126 for an application and to make an appointment to apply for their ID card. Fee of $100. Applicants on Medi-Cal will be charged $50. Exact cash or money order only. At the appointment, a photo will be taken and the Contra Costa Health Services will send the information and photo to the California Department of Health Services. 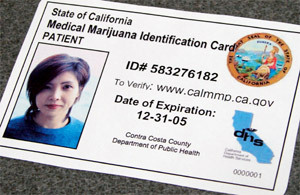 Following the state's verification of information, a state-issued Medical Marijuana ID card will be sent to Contra Costa Health Services and you will be notified that your card is ready to be picked up.